Thinking of adding a spiral staircase to your home? There are several factors that you’ll want to bear in mind. 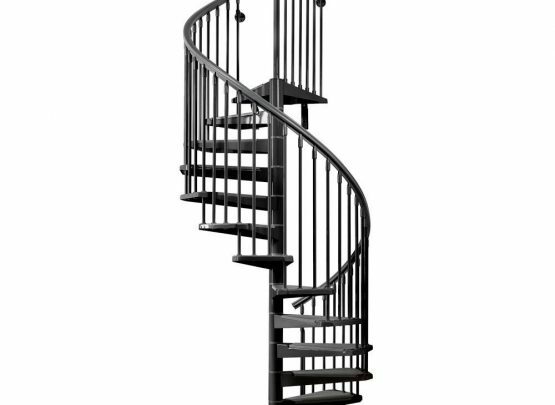 A spiral staircase is a staircase with one central newel post, with which the treads all branch off of and are supported by. Each tread widens the further away from the central newel post, with any balustrading or handrail being attached to the furthest side of the tread. A spiral staircase is mainly used in homes where space is at a minimum, with the staircase rotating on top of itself, the footprint of the staircase is actually less than a traditional staircase. With a lot of people seeing these staircases as stylish and modern, we’re looking into the reason why they may not be all they’re cracked up to be. Over time we’re hearing more and more people asking us to take them out of their houses. Impractical Flow down the Stairs. With all staircases, when people are walking down them they look to take the shortest route possible down the stairs and into the adjoining rooms. If a staircase turns to the left with either winders or a quarter landing, the quickest route down the stairs is on the left hand side. When walking down a spiral staircase, people will naturally want to walk closer to the newel post at the centre, which is the shortest distance down the stairs. However, this is counter-intuitive as the closer you get to the newel, the shorter the tread is, making it the fastest as well as the most dangerous route. Even though a spiral staircase takes up less room in someone’s house, in almost all situations you end up with a circular footprint in a square room. This leaves space in the corners against the back wall of the room, these extra spaces have no practical living use to them and would in-fact be better used to making the stairs bigger and safer. A spiral staircase, historically, was used in castles and old stone structures. The reason for this is that it would prevent attackers from ascending the staircase whilst holding or using weapons. This is because the narrow width purposefully constricts people, especially when in a clockwise orientation. This design, even though practical in a historical sense, will prevent them to be used in a living setting in a modern setting. The disposition for spiral stairs preventing people from using weapons inherently makes it difficult for people to carry furniture up the stairs. Even though a spiral staircase may be very appealing to you, it may have the opposite effect on someone else. Unlike other staircases which may not set the world on fire, they aren’t going to negate a sale or negatively affect the value of your home. However a spiral staircase is something that splits opinion, and a potential buyer looking at your home might only see a spiral staircase as a negative and something that will need to be removed. If you are looking at a spiral staircase, thinking about the possible influence on re-sale value should not be overlooked. There are the 4 Disadvantages of Spiral Staircases, if your decision has been challenged by this post and you’re thinking of other options, why not take a look at our other blog post at the different types of staircases available.